Claim "Villa Angelia Chinese Restaurant"
Ever visited Villa Angelia Chinese Restaurant? How was their customer service? 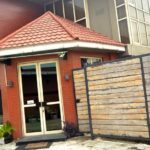 Located 1 km from Red Door Gallery in Lagos, Villa Angelia Victoria Island and Chinese Restaurant features a restaurant and free WiFi. Guests can enjoy the on-site bar. Free private parking is available on site. All rooms come with a flat-screen TV. Certain rooms have a seating area to relax in after a busy day. Each room has a private bathroom fitted with a bath or shower.